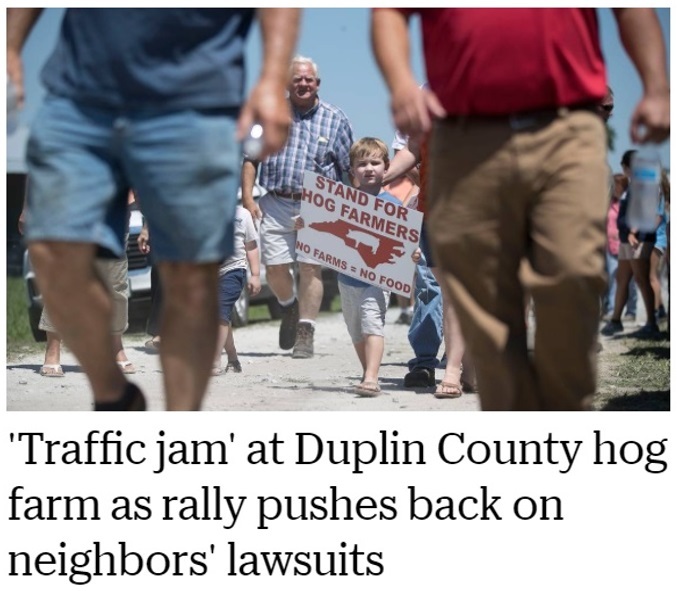 As a jury was being selected in Raleigh for the third nuisance trial, supporters gathered on a hog farm in Duplin County, generating this N&O headline. 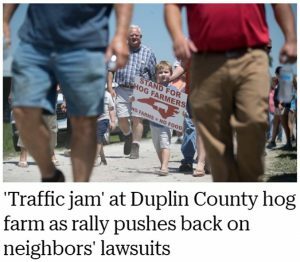 On Tuesday, a world away from the federal courtroom in Raleigh, a great crowd gathered on the farm of Joey Carter in Duplin County. It was young and old, it was farmers and city folks, and even some media came and looked in for a bit before heading away to file their stories. The purpose of the gathering was to show appreciation and support for Carter, his family and, broadly, for hog farmers and all of those who labor daily to produce our food. Hundreds of people gathered next to the hog houses at the farm, literally steps from the lagoon. No one was offended by odor. It was frankly hard to say there was any. And to no one’s surprise, the farm was exactly as the closest neighbors say it always is – no issue, no concern, certainly not a nuisance. We know the jury has said otherwise, and we know this was a deeply unfair result. At one point, the media looked at a state representative and wondered about that. At that same moment on Tuesday, two Texas lawyers who are bringing the lawsuits were back in the courtroom in Raleigh, studying and scrutinizing a fresh pool of 52 jurors. Yes, the next jurors. A third trial involving hog farms in North Carolina is now underway. Jury selection was Tuesday, and the Texas lawyers were looking for any edge amid the whittling that takes place to determine the 12 who will decide the case. Many potential jurors were dismissed to care for sick parents, or prepare for surgery, or for job issues or to keep long-planned trips to Disney or Gatlinburg or the beach. For their part, as the whittling went on, the Texas lawyers wanted jurors asked some questions. Questions about their views of agriculture and hog farming and “frivolous” lawsuits and “corporations” and other such probing issues. Strikingly, as some of the potential jurors explained connections to agriculture or farming – it is the state’s leading source of income, after all – there seemed to be concern from the Texas lawyers or the judge that they might not be fair. As hands went up, the Texas lawyers scribbled away. They wanted to know: Who has ever lived in Pender, Duplin, Sampson, Bladen, Robeson, Johnston, Onslow, Wilson or Harnett counties? Rural, farm counties. And then, at a certain moment, the courtroom procedure allowed for them (and Murphy Brown’s lawyers, too) to dismiss some of those possible jurors. The Texas lawyers huddled in the hallway first. When they returned, the lawyers nixed a woman from Harnett County who said she was a member of the North Carolina Farm Bureau. She’d raised her hand on the country living question. They nixed a former Army officer who now works at the tire plant in Wilson. He had said it was important to preserve North Carolina’s agricultural way of life. Then, the Texas lawyers wanted to know more about a woman from Wayne County, which is No. 4 in the state for pigs. The woman spoke about the importance of farming to the Wayne County economy, saying a family business benefited through sales to some elements of the hog industry. “People need to eat,” she said at one point. The judge asked if she could be fair to both sides, and she said yes. And then the Texas lawyers struck her from the jury. When it was all said and done, 12 jurors were seated on Tuesday. Seven of them are women from Wake County, population 1 million. They are joined by a man from Wake County, too. Not one juror is from a top hog or pig producing county. None are from east of Interstate 95. Over the next month, these are the jurors who will decide if two adjacent hog farms in Pender County (population 57,000) are a substantial, unreasonable, willful, wanton and malicious nuisance to six neighbors. Murphy Brown wanted the trial held Down East. The judge wouldn’t allow it. Murphy Brown wanted the jury to visit the farms. The judge won’t allow it. Instead, the jury will sit in an air-conditioned, wood-paneled courtroom in Raleigh. It’s 100 miles away from the farms being sued. It might as well be 1,000.